April’s warmer temperatures and typically dry weather signal spring is here, meaning it’s time to prune branches damaged by the winter cold and prepare for the growing season. When flowering shrubs finish blooming, it’s time to shape them. Mulch your garden now to control weeds, retain moisture, and protect roots from that hot summer sun. Plant summer annuals to bring color to your flower garden and plant vegetables to eat, using plenty of compost, peat, and manure. You’ll also want to fertilize and use pesticide sprays. Feed azaleas with special acid fertilizer after they bloom. Remember to feed your lawn and shrubs, if you haven’t already, and palms. Those palms need to be fed three times a year with a fertilizer containing manganese. Spray citrus with a nutritional spray to protect the fruit and control melanose, a fungal disease. Other fruit trees also will benefit. Monitor for whiteflies, spider mites and powdery mildew and treat promptly. Acephate will control thrips, insects which are very damaging to roses, gladiolas, gardenias and other spring flowers. Use thuricide to control caterpillars— it won’t harm beneficial insects. You’ll need to monitor your lawn and plants and water as needed. April is also the best time to sod, plug or seed your lawn. Be sure to power rake Bahia and verticut St. Augustine if necessary. 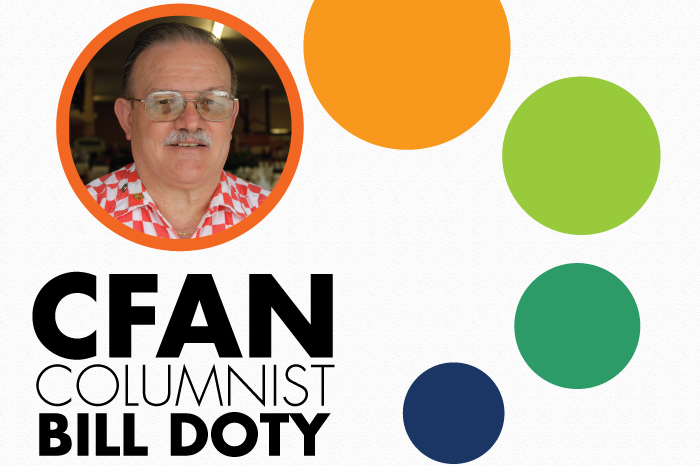 William R. (Bill) Doty, is the owner of Doty’s Farm and Garden Supply Inc. Founded in 1954, Doty Farm and Garden Supply, Inc. has been there for every one of their loyal customer’s budding needs. Bill Graduated from Winter Haven H.S. and then Florida State University, Bill learned invaluable lessons in listening, asking questions, and reading anything related to the family business and shares his knowledge with his customers daily and our readers each month.